So the exciting news is that Bridge2Aid Australia is launched! I had the priviledge of travelling to Perth and then on to Sydney for the various launch events and interviews which marked the official commencement of our work in Australia. The launch marks the culmination of more than 18 months of hard work by a number of people. It was in 2014 that I was first approached by Grant Pierce, a friend and Australian mining engineer who has worked in Tanzania for many years. Grant is somewhat of a local legend when it comes to community and philanthropic work in the rural areas, and first suggested that establishing Bridge2Aid as an entity in Australia would be a great source of volunteers and fundraisers. After going through the various registrations (all handled very ably by our Australia board member Peter Whyte), we assembled a board, including Grant, Euroz Executive Director Nick McGlew, and dentist Dr Jeremy Keating. Work towards last week commenced in earnest in January when I first made contact with Scott Park, Sydney resident in who after working with 3M, now works in dental education events. Scott has been a fantastic resource to Bridge2Aid and a good friend as we sought to establish the first key relationships. He very generously opened his network to us and enabled us to connect with the right people to start to grow support. I’m also particularly thankful to the ADA Western Australia Chief Executive David Hallett and Simon Shanahan, Chair of the Federal ADA Volunteering Committee for their warm welcome.. We also have great support from Chris Ho who along with Scott helped introduce us to the eastern state dental community. Finally I’m very grateful to our founding donors from the dental industry – A-dec and Henry Schein Halas, as well as those from the mining industry – ECG Engineering, AUMS, Kibaran Resources. Finally to Jeremy Keating Dental Practice, Care Dentistry and Road Bend Motors. These companies have shown faith in us from the very early stages and have allowed us to get the whole organisation off the ground. All this work paved the way for the launch event at the Australia Dental Association New South Wales branch centre for professional development on Tuesday 11th October. I’m very grateful to everybody that came to that event and in particular to Australasian Dental Practice Magazine and its owner/publisher Joseph Albeury, and David Petrikas, for their pre launch publicity and promotional assistance. The launch event was a great opportunity to explain how Bridge2Aid is different – how we focus on strengthening primary healthcare through the provision of emergency dentistry to relieve pain and to prevent complications in rural communities. 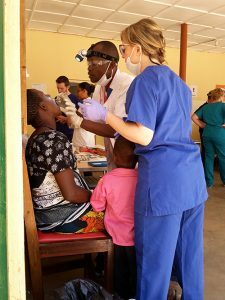 About how volunteering with us is very much volunteering as a trainer in order to pass your skills on to local health workers, who are then able to carry on the treatment after you have left, and established the foundations of an emergency dental service in East Africa. It was a great encouragement to have so much positive feedback from the event, and this then flowed into the interviews that were lined up with Bite Magazine, the Dental Files (ADA podcast) and Schein TV. I’m very grateful to Brett Tyler, for setting up the latter of these two interviews, which I’m looking forward to seeing released in the coming months. If you are new to Bridge2Aid and what I have written above intrigues you please have a look around the website, consider making a donation to the valuable work that we are doing in Tanzania, coming and joining with us as a volunteer, or getting your practice or team involved in fundraising. We’d be delighted to have you on board.